We, the 3 of us who have been visiting the Musas for some time and many more times than any others, have not been allowed to see either Gloria or Chiwar for weeks now. Recorded delivery letters have been sent to both prison governors regarding the 12 August Holloway prison visit where Gloria was not allowed to be brought to us 3 visitors and to other visit grievances involving Chiwar to which there has been no replies as yet from either prison. Yesterday Friday 9th December I and Belinda McKenzie visited Mr Musa at Pentonville Prison for the first time since his incarceration on remand, following his and wife Gloria Musa’s hearings at Haringey Magistrates Court on 30th November and 7th December respectively. We are friends and McKenzie friends in court hearings of Mr & Mrs Musa. We are most concerned at the treatment Mr Musa is receiving whilst resident at Pentonville. I had booked the visit yesterday, however when we arrived the staff had no recollection of my adding Belinda, therefore she was not allowed to see Chiwar, to our and his great disappointment. In fact, we had already booked a visit on Tuesday 6 December, 4 days previously, only to then be told there is no visiting on the first Tuesday of the month. Chiwar has not been receiving any emails from us. I have sent him 2, and others have sent him emails too, that he has not received. At 30p per email sent we demand to know why our money has been taken when nothing in return has been given? Chiwar told me all postal mail in and out has been disallowed for him. Why is this? There have been other instances of victimisation and targeting by the prison staff towards Chiwar Musa, very similar to the treatment his wife Gloria Musa has been enduring whilst simultaneously a remand prisoner in Holloway Women’s prison, in that prison warders have told other prisoners that he has mental problems therefore he is to be avoided. This is of course against his human rights and totally inhumane as he has no history of mental illness whatsoever. We fear the stage is being set to have both Chiwar and Gloria sectioned, in order to reinforce this scenario of mental insanity and make it easier to control them absolutely, so that the people who have stolen their 6 children from them and are attempting to brand them as child-abusers can keep the children indefinitely. We request your immediate intervention in this situation which is against the rules for prisoners on remand, as well as against ethics and human rights. Chiwar Musa has not yet been sentenced and is in any case innocent of the charges against him, as will be proven. Therefore we demand that he receives the same rights and treatment as other prisoners on remand in UK prisons. 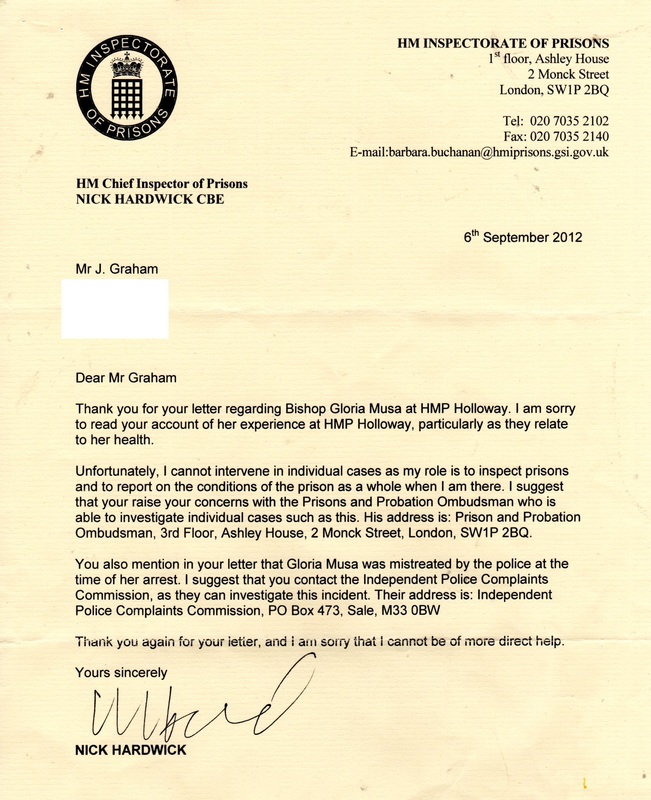 Also below are other communications I received from the Ministry of Justice from April and the Inspector of Prisons when I tried to complain about the atrocious victimisation of the Musas whilst in prison, which continues to this day. Never is anything ever done, and to this day mail is being denied them, as are other things, such as emails sent to them via the “emailaprisoner” online service. Regarding the “booking line” fiasco i complained about they mention in the reply letter above they fail to mention the subject of my complaint: that often when one phones up on a Sunday, even though they state the booking line is closed then in their reply to me, they fail to mention their phone lines are still misleadingly open and say when one calls that one is being held in a queue waiting to talk to a prison employee to make a visit – often for literally hours – this is carefully avoided in their reply to me..
…this “atrocious behaviour” does not seem to have stopped, according to the latest letters received from Gloria. 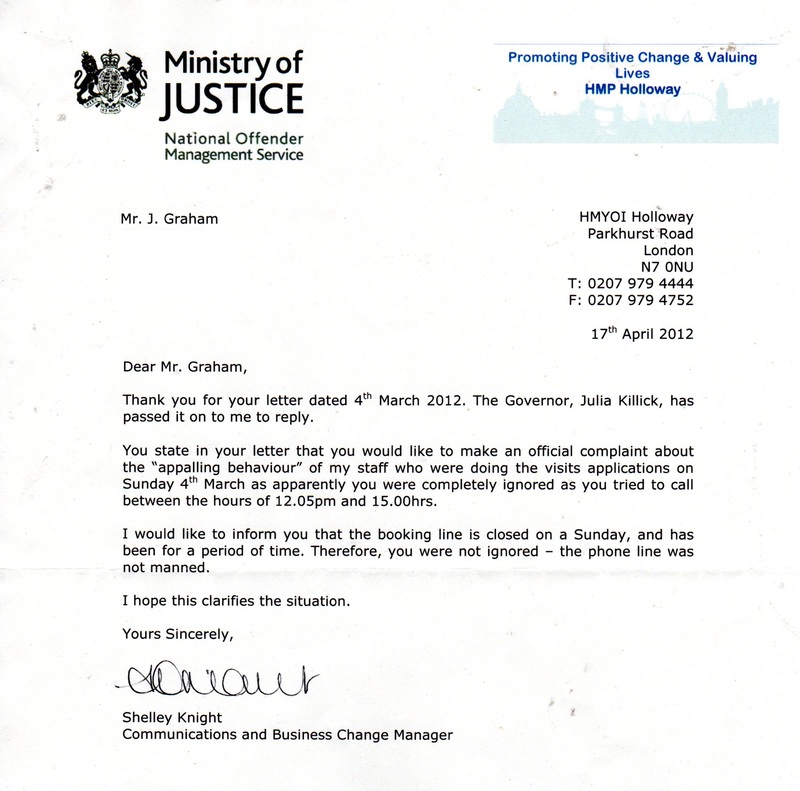 This entry was posted in Uncategorized and tagged replies from ministry of justice prison governor killick. Bookmark the permalink.